It sounded like a freight train…. 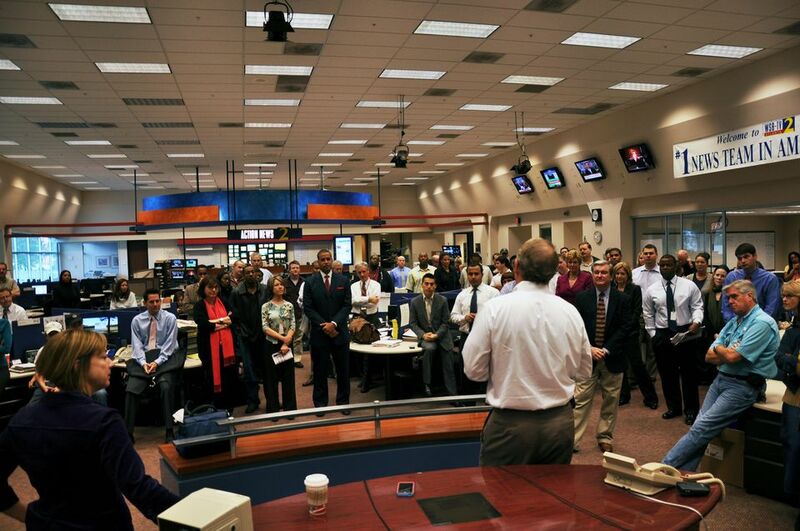 That sound you heard Sunday night was the tornadic fury of WGCL’s news judgment imploding. On a day when tornadoes caused states-of-emergency in a half dozen Georgia counties, WGCL led its 11pm news with a Ryan Deal “exclusive” on a Craigs list scam that misled a couple of metro families, who were too embarrassed to show their faces in Deal’s story. There was no question the pre-dawn storms were the story of the day– likely the story of the week. Following Deal’s piece, WGCL gave the storms a too-brief mention– then moved on to Jenna Bush’s wedding. Then came another exclusive: A Wendy Saltzman “investigation” on illegal spyware that can trace cellphone calls. Saltzman’s piece wasn’t bad, though it had no victims of this threat. Meantime, WAGA led its 10pm news with solid tornado pieces by Julia Harding, George Franco and Darryl Carver. Even WXIA/WATL was sensible with its 10pm lead by Catherine Kim, whose on-air reaction to a technical difficulty will end up in this year’s Gorilla Ball. Kim’s flub was a human mistake. WGCL’s ineptitude was premeditated. Viewers of WGCL had to wait six minutes before the station finally threw to Christopher King, whose sole package represented WGCL’s tornado coverage. Now we’ll just pile on. As part of the team coverage the storm deserved, King’s piece might have been acceptable. As WGCL’s sole entry, it was lame. His best interview was with a woman who wasn’t even there when the storm hit. His writing tilted dangerously close to cliche territory, with its references to the “path of devastation” and its “battering homes into piles of sticks.” Granted, tornadoes automatically bring cliches with them, like exposed nails in splintered lumber. The trick is to step around them. Saltzman and Deal’s stories weren’t bad. As stand-alone pieces of enterprise, they actually worked. But they weren’t more important than the storms. WGCL is apparently obsessed with the notion that it must lead each newscast with a story seen “only on CBS-46.” Sometimes, you gotta throw away the formula just to keep from embarrassing yourself. Sunday was such a day. This entry was posted in Uncategorized on May 12, 2008 by live apt fire. Over at WSB Glenn was recommending footbal helmets for the kids. While over at WXIA, Orelon Sidney called from home in Riverdale and reported what she saw while standing at her front door. This was right around the time of the tornado in Ellenwood. Paul Ossman was noticeabley concerned and seemed to think she should be inside. I wonder if WXIA producers told her to go outside or if she came up with that bright idea on her own? WSB had the best coverage, but I had to flip around to see what everyone else did, especially since WSB’s eye-popping colors are too much to handle at four in the morning. Orelon Sidney was a great hire for WXIA, one of the best weather talents in town. WAGA should have tried harder to keep her. Do you think that if the tornadoes had happened north of I-20, this would have received more play? WGCL is under rule of an irrational small few who refuse to take into consideration the entirely rational, and educated, ideas of those who actually come into contact with the real human condition outside the cosy confines of Meredith’s Atlanta property. Orelon is probably the best weather person at WXIA. She’s the only one worth their weight in spit over in their weather department. I noticed as I flipped between the channels Sunday morning, that WXIA was the first on with video. I wonder if that’s due to Orelon?